Although the 'Huskers went 10-4 and made it to the Big Ten championship game, there is a sense of urgency around the program. Nebraska lost 70-31 to Wisconsin in that championship game and was beaten easily by Georgia in the Capitol One Bowl. Nebraska is winning; they are 48-20 the past five years but they have been unable to take the next step. Taylor Martinez is back once more but it is the same old story; average defense and lack of playmakers make it another average year in Lincoln. pained him over his career. He did improve last year and showed signs of becoming a dual threat early on last season. 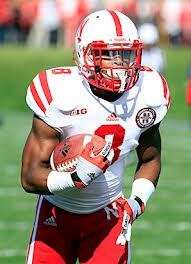 Although the Cornhuskers will miss Rex Burkhead, junior Ameer Abdullah is more than ready to fill his shoes. Abdullah had 8 touchdowns and averaged 5 yards a carry as Burkhead's backup. Unlike Burkhead, Abdullah is more of an open field back than a between the tackles, psychical runner. Abdullah is quick and agile and extremely elusive and should be a lot more exciting and likely just as successful as Burkhead. Receivers: For years coach Bo Pelini has searched for a reliable target to grow a passing attack. He may have found one in junior Kenny Bell who had 50 receptions and 8 touchdowns last year. Bell is an exciting threat that can stretch defenses vertically but he is a little bit inconsistent. With Bell stretching the field it should leave openings for senior Quincy Enunwa. Enunwa had 42 catches in 2012 a number that should increase. Enunwa isn't very explosive and isn't very fast but he finds ways to get open. Junior Jamal Turner also returns to give the 'Huskers their top three leading receivers in 2012 back. Turner is dangerous at times but like Bell is inconsistent. Turner can make plays down the field and has good hands. Redshirt freshman Alonzo Moore could end up being the most dangerous receiver on the roster. He has an electrifying game and is very athletic. Pelini and their staff use their tight ends well which means opportunities for sophomore Jake Long. Long is a big, psychical target and should help in the red zone. Offensive Line: The good news for Martinez is that he has a superb line protecting him. Senior guard Spencer Long will fight for All-American honors after a fantastic sophomore year. Long has the great combination of size and strength that just makes him a force. Also helping out Long on the right side should be another experienced senior in tackle Andrew Rodriguez. Rodriguez is a monster and a very big presence on the perimeter. Though Rodriguez doesn't read pass rushers very well and is not athletic in the least. Protecting Martinez' blind side will be another senior Jeremiah Sirles who improved mightily in 2012. Sirles is also massive and an intimidating presence who moves very well. The left guard position is up for grabs but junior Jake Cotton will likely man it. The most intriguing linemen on this roster is Canadian David Knevel. The 6-9 tackle who should immediately make an impact as a freshman was the first Canadian to sign with Nebraska since 1999. With all these seniors Knevel might be a redshirt but could be a future NFL prospect. Defensive Line: In order for the 'Huskers to recapture their glory years the defense must turn back into a force. And that all begins with the line as they have to apply pressure on opponents. Senior end Jason Ankrah is the only proven pass rusher and even he wasn't much of one in 2012 recording two sacks. Ankrah is big and athletic but isn't fast enough to get to the quarterback but he can help in run support. The other end will be freshman Avery Moss who has big time potential. Moss is also more of a run stuffer than a pass rusher but has the athleticism and smarts to be a force. JUCO find Randy Gregory should make an impact from the beginning for Nebraska. Gregory has good size, standing at 6-5, 240 pounds and has amazing athleticism. If Pelini or defensive coordinator John Papuchis need some instant excitement they could turn to Gregory. The interior linemen are undersized but still have talent and are great run stoppers. Sophomore Aaron Curry can get to the quarterback occasionally and has a nose for the ball. Like Moss he has loads of potential but is very unproven and may need some more time. Linebackers: In last year's Big Ten championship game loss to Wisconsin the 'Huskers allowed 539 rushing yards. Much of that can be blamed on little impact players at linebacker. That should change as Nebraska welcomes back junior Zaire Anderson who missed much of 2012 with a torn ACL. Anderson can make plays at the outside linebacker spot whether it be as a pass rusher, helping in the rush defense or even as a coverage 'backer. Anderson has bulked up and now looks strong enough to have a big 2013. Sophomore David Santos is likely to start at the middle linebacker position and has talent. Though if the rush defense is to improve, Pelini and the 'Huskers need an impact middle 'backer and Santos may not be that guy. The "Buck" position is in question as well as two redshirt freshmen, Jared Afalava and Thomas Brown will fight for the job. Nebraska really focused on this unit in this year's recruiting class with the additions of a number of players including Marcus Newby and Courtney Love, two four-star finds. Secondary: As bad as the rush defense was the pass defense was better but still has room to improve. Nebraska has great experience and talent at the cornerback positions in seniors Ciante Evans and Andrew Green. Evans was an impact player all of '12 recording 56 tackles and two interceptions. He recognizes plays well and can be a force in any aspect of the game. Green isn't as much of a big play threat but he is a lockdown corner who can be a hard hitter at times. Also returning is junior Josh Mitchell, who despite his small size can make a lot of plays. Senior Stanley Jean-Baptiste also returns to give the 'Huskers a group of cornerbacks who can help in run support and also be shutdown. Though the rest of these defensive backs are less experienced but talent remains. Juniors Corey Cooper and Harvey Jackson return to be instant contributors but the rest of these safeties are inexperienced and unproven and there is little depth. If this defense improves and Martinez continues to develop the Cornhuskers could battle to a second straight Big Ten championship appearance. If these things don't happen Nebraska could flounder in a deep Legends divsion.